– Coverage is terrible. We did not get the 30 sq. feet per gallon for the 2 coats. Closer to 20 sq. feet for two coats. We spent over $350 on our 200 sq. foot deck. – About 40% of the deck had mold. – This product is not easy to apply. It splatters and we had to constantly back wipe to ensure an even appearance. The roller that comes with the kit is useless and does not last. It feels like you are applying a coat of tar with sand in it. – The Rust-Oleum Deck Restore does not darken in color. – Be prepared to sand this off for switching to a different brand. Might be easier to fill deck boards or replace the floor. – The Synta Deck Restore started the craze of the “Deck Resurface” products. Synta’s version was bought by Rust-Oleum and the formula may have changed. Looking at the online history of reviews for this product, it seemed to work better prior to the acquisition. We cannot recommend this product based on our testing, numerous poor online reviews (check Amazon), and the class action lawsuit. If you can’t back up your product or notify consumers of a bad product and a class action lawsuit, You shouldn’t be in business in the USA. We stand behind our quality in the USA. Agreed. They sold a poor product, knew about it, and they are still selling it to unknown consumers at Home Depot and other places. They obviously do not care. Our experience is similar to the others. Purchased 2 – 5gallon buckets in Sept. Of 2016. Followed preparation and application directions. 1st year showed some signs of failure. This year rinsed deck with pressure washer and majority of flat surfaces were peeling. We used the cream or light tan color. Leaves or anything with any color will stain the deck. Ours is a very large deck around a pool. I am not looking forward to redoing this deck again already. Have sent a complaint to rust-oleum. Waiting to see if I get a response. This stuff is awful! Trying to figure out an easy way to get it off my deck! I used RustoleumDeck Restore 3-4 years ago. At first, I was very pleased with its appearance. After about two years, I noticed the product was cracking. Then, soft spots appeared in the deck. The cracks in the product had allowed water to seep in and become trapped. After Peeling away the product, I found many deeply rotted areas of decking. Some were 3/4 in. deep and 6 in. in length. I covered an upper and lower deck with Rust-Oleum Deck Restore, and regret doing so. The decks had no areas of rot prior to using this product. I used the 10X 3 years ago On my deck 12’X40′ I can’t be more pleased Preparation is the ultimate key to success. I used a mixture of 4 Qts water to 1 qt bleach with 2 cups dawn dish liquid in my pressure washer twice, then let the deck air dry for 4 days before I applied it. 2-1/2 years ago).. I’d estimate that only about 10% of the deck surface actually began peeling. We did not pressure wash prior to application; only sanding and blowing off residue with an air compressor. And we waited for several rain free and warmer days before applying. Please reply as to what product you used AFTER Rustoleum. Thx. Do NOT, I repeat, Do NOT buy this product. I applied this product to our 3oo sq. ft deck and have regretted it ever since. I built the deck using kiln dried lumber to limit shrinkage and cracking. I followed instructions exactly, and was dumb enough to go buy more product to patch the sections that were peeling. You cannot remove this product easily as the stuff that has actually adhered to the wood is extremely difficult to remove. I ended up pulling my deck boards up and replacing them, no easy task. Used this product on my deck. I cleaned and prepped as instructed by mfg. It started peeling after 1 month. It is now 1 year later and it has all completely lifted and peeled leaving some stuck in spots. DO NOT USE THIS PRODUCT! It does NOT hold up to the claims of the company, Rust Oleum. Definitely would NOT recommend. Used this 3 years ago. Looked great for the first summer but started peeling by the second summer. I am now struggling to remove the rest from my deck. Would not recommend. I will have to replace my entire wear around deck!!!! This is absolutely the worst product on the market. I will be submitting a complaint to the company but I need to know if I can apply a standard water seal over the deck to protect it as it is peeling all over the place – not just where it is walked on the most. Help please. No easy way to restore this. Sanding and scraping to remove. Peeling after 1 year wood splintered We put this on 3 decks and a dock painstakingly after watching videos. we even contacted a professional to get input. We followed all instructions to the letter because the deck areas were so large. Can't even tell you how frustrated we are. 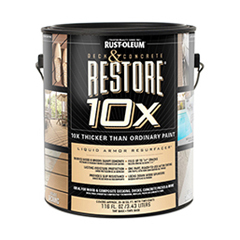 What is the rating or has anyone used the Restore X 2 product, and if so, what kind of results were obtained? It seems that none of their products work based on all of the horrible consumer reviews. Used this product the 4x on our deck last summer. Wood was prepped. Very surprised and disappointed that we are having to start over. Peeling off and wood is showing black mold underneath. Spent yesterday powerwashing it off and now looking for a new solution. After following all the instructions and making a pretty expensive product, six months later the peeling began and continues. The deck is one out mess. RUSTOLEUM needs to provide a booklet on how to remove the treatment. I will try sanding and start again with something else. How do I join the lawsuit? I am disappointed in the product as a whole; I spent hours applying this (not an easy task) and now it is chipping splitting and peeling in sheets! Not only does my deck looks terrible but sounds awful when I walk on it….. and it has only been on it for a couple years. Last year I noticed a few areas that weren't even heavy traffic areas and this year the stuff started peeling up in sheets. Now I have another back breaking task to take on trying to get this off of my deck so I can start all over again. Guarantee I won't be applying this product again. Had the same exact problem as you. Now how the heck do you get it off the two decks my contractor put in on? Worst product I have ever purchased. Never again. Would rate Rustoleum a zero!!!! I purchased this product from Home Depot in 2013 and lost my receipts by accident and if someone could tell me how to retrieve them I would be grateful.This product looked good at first but after not even 1 year it started peeling all over the place.Before I even applied this product I watched U tube video how do use this product and I followed the instructions completely , totally disgusted .How do I become part of this lawsuit? Refund is fine but it's going to cost THOUSANDS to replace my deck from the damage done from Rustoleum! Terrible investment! Home depot sold it too us just to get off their shelves! If I find a good receipe everyone needs to have it, I was excited to have a low maintaining deck, Its more work now trying to get this resolve off the deck, pressure washer cannot even take it off! The video of this product is true this product chips and flakes a complete Mess, Rustolem stop producing this product and help me get something to take it off my deck now? It seems a shame to give this product even one star! I would not recommend this product!!! I spent a lot of money using this product last summer to repaint my decks…it is all peeling up!!! And if that isn't bad enough the wood under th paint is wet and some has started to rot!! !so not only do I have to peel the paint up off the wood but have to replace boards!! Very unhappy!!! I certainly will not recommend this product at all. My deck surface was peeling off after one year after the winter months. This application was done in Chicago around september. Horrible all the way around! I would never recommend this to anyone. Spent a ton of money on 4 three gallon buckets and the primer also. We learned our lesson! My experience with this product was exceptionally bad. Followed the directions and prepped the deck, yet product is peeling off in many locations after one year. The video at this website accurately depicts my results and situation. Now, after spending about $600 am faced with even more costs. DO NOT BUY THIS PRODUCT. You may regret it like I am. Peeling after 1 year? Try one month! I'm so disappointed in this product. Horrible horrible horrible. The sand in this stuff clumps up in places, and then in other places, you're left with just paint. Looks like a topographical map, not a deck. I would not recommend this product at all. It WILL start peeling up a few months after application. We pressure washed our deck as the instructions said. This deck had previously been treated, for years, with Thompsons deck preservative. I am not sure how this product would do on untreated wood. Cleaned my deck with pressure washer and then deck cleaner to prep. Cost me over $400 for Restore. I applied last summer and it is peeling terribly. Would never recommend this product. Looked beautiful after I first applied it. Now I could cry. I'm a 68 yr old woman who did this by myself. Don't think I have the energy to repeat. Would rate a 0 if possible. Looks a mess! Painted an older swing set with it- took four gallons. Three months later I'm flaking it off and re coating almost the whole thing. They want a rating based on 2 years of product being used. After under 1 year this product was bubbling up, cracking and coming up in large strips from my deck. I would rate it at 0 stars if it was possible! We are in the process of trying to remove this from our deck. We applied it two years ago and now it is peeling horribly in sheets. Pressure washing is not getting if off enough for us to restain. Sanding is very time consuming. We may need to replace the boards on all the floors if we cannot get it off. I am going to look into the class action lawsuit. We spend a fortune on the product and now we are stuck paying more to fix it. Very disappointed to say the least! How do you remove this junk from concrete? Like most, I found it peeled easily. I doubt it can be removed easily. Probably grinding it off would work.